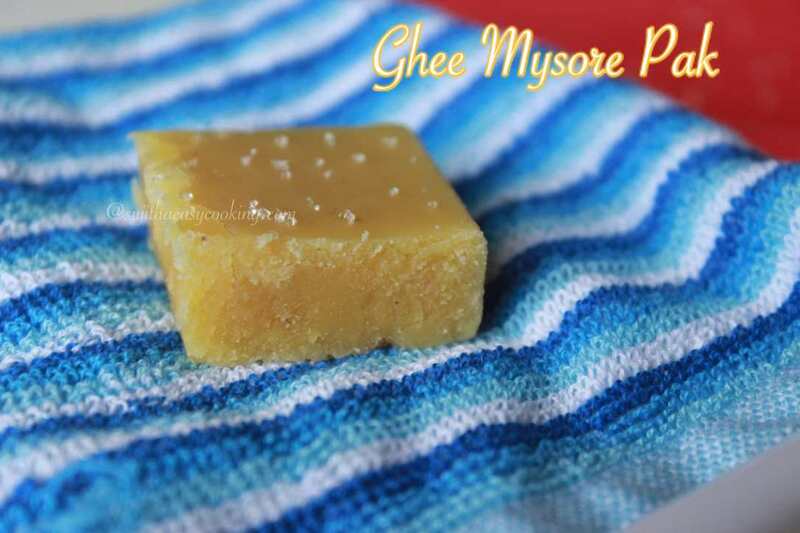 Mysore Pak/Ghee Mysore Pak, Myt brother always fond of Mysore pak.. from his childhood he always prefer mysore pak in his list, but i don’t like mysore pak in my childhood.. Recent days i learnt to taste this yummy sweet, the excess ghee taste roll in mouth to melt the sweet.. earlier i shared a recipe on mysore pak.. but I’m not completely satisfied, though i searched for some good end.. Here one of my Aunt, shared this recipe,she tried from a cookery show.. she was like 100% confident with the Result and initiate me to try this yum.. and of course the my mysore pak is too good in taste.. very happy with the end result.. i couldn’t take better shot in my busy schedule..
Measure and Take the Beasn flour, Set aside in a bowl. Now measure the Ghee in the same cup..
Take ghee and oil in a pan..
Bring this to boil, just bring the ghee and oil together..
Add a teaspoon of ghee to the Flour..
Sprinkle the flour lightly with a spoon..
Sieve the Flour mix in a mixing bowl..
Now the play going to start in fire, no need a high or medium flame to prepare this recipe, double check keep your flame in low, Take the sugar in a pan..
Add in the Water, no need to see for string consistency, just, heat the pan with low flame, wait until the sugar dissolves..
Once the sugar dissolves in the water.. add the sieved flour little by little, just add spoon full of four in each stir.. stir the mix without any clumps..
Add a spoon full of ghee mix to the pan.. once you add the ghee, give a fast stir, the ghee will absorbed easily..
See i add all the ghee and oil mix, but there is no trace of ghee, if you pass this step then 50% the mission was done.. Immediately Transfer the Mysore pak mix to the Greased plate.. Wait for 10 mins, Grease the knife with oil, cut into slices.. once they completely cool down remove them from tray.. While sieving the flour, some how you need to break the lumps.. Adjust the Sugar to your preference.. Always cook the mysore pak in Low flame. Wow! Yummy & easy recipe too. Thanks dear ?